Not many think of the jackal when they think about large or medium-sized carnivores. But this species has been staging an impressive comeback, including in Romania, where it thrived in the past few years, being perceived as quite a controversial wild animal. The beginning of the golden jackal (Canis aureus) is still uncertain but fossil evidence suggest that the species arrived at the southern edge of Central and Eastern Europe about 8,000 years ago. The ancestor of the golden jackal is believed to be the extinct Arno river dog that lived in Mediterranean Europe 1.9 million years ago. 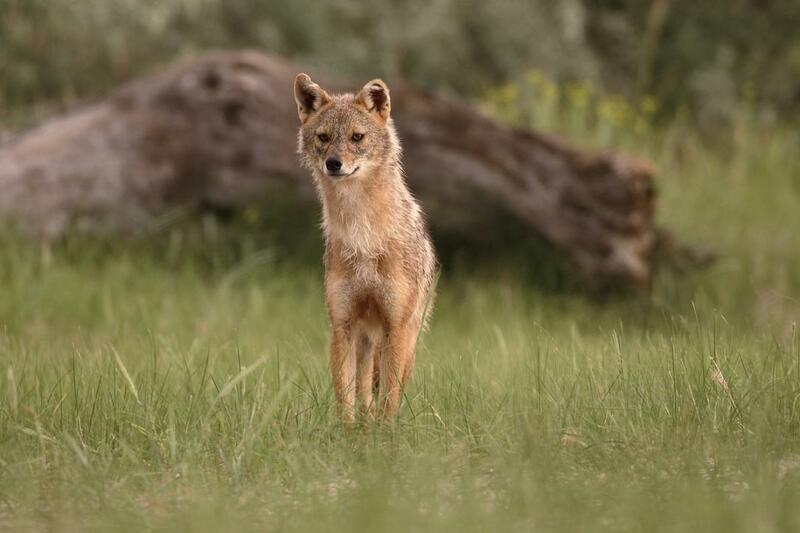 The golden jackal is a wolf-like canid that many often mistake for a small grey wolf. And that happens because the differences are rather subtle, with the golden jackal being smaller and more slender, with a narrower, more pointed muzzle, and shorter legs and tail. Golden jackal males measure 71–85 cm in body length and weigh 9-15 kg while the females are smaller, measuring 69–73 cm and weighing 8-12 kg. The jackal’s fur is relatively short, with the base color golden, varying seasonally from a pale creamy yellow to a dark tawny. The fur on the back is composed of a mixture of black, brown, and white hairs. The golden jackal is a strictly monogamous animal. The mating period usually lasts between February and April, with the pups (normally between four and eight) being born in April-June. Weight at birth is 200-250 grams. Pups' eyes open after about ten days. The pups are nursed for about eight weeks, and then weaned. As for their social behavior, the breeding pair is the basic social unit, and they are sometimes accompanied by their current litter of pups. They are territorial and hunting families usually hold territories of 2-3 square kilometers throughout the year. Both the female and the male mark their territory. Family or pack members communicate with each other by a screaming yell and yapping, or a siren-like howl when a kill is located. Also, golden jackals give a warning call that is very different from their normal howling when they detect the presence of large carnivores such as wolves and tigers. The jackals are opportunistic animals, being both predators and scavengers, with a diet that varies according to its habitat and the season. They eat both animal and plant food, including small (and even medium-sized) mammals, ground birds and their eggs, reptiles, frogs, fish, fruits, carrion, and antropogenic food sources like garbage and slaughter remains. On the positive side, the golden jackals play an important scavanging role by eating garbage and animal carrion around towns and villages. They also benefit agriculture by preventing increases in rodent populations. But there’s also the negative side, with this species being perceived as a harmful pest, mainly because it attacks domestic animals such as turkeys, lambs, sheep and goats. This also happens in Romania’s Danube Delta for example, where this behavior (and the rapid increase in the number of golden jackals in the area) has reportedly led to human-animal conflicts in recent years. And while hunting could help control the population of jackals and prevent the human-animal conflicts (including in this area of Romania), other methods should be implemented as well, such as limiting the access of domestic animals so as to keep them safe from possible jackal attacks. In Romania, the golden jackals are believed to have come from the South (from Bulgaria) amid a warmer climate due to climate change combined with historical decreases of wolf populations. In fact, the jackals prefer to stay away from the wolves and their territories, as the wolves are their main enemies. These animals can be mainly spotted in the South and Southeastern parts of Romania, such as the Danube Delta, Campia Romana and the region of Oltenia, but also in the region of Banat in Western Romania and even some areas of the Subcarpathian Hills. Hunting is allowed all year-round in Romania. Estimations show that the number of golden jackals has been increasing rapidly. Experts believe that the European population numbers between 97,000 and 117,000 individuals, currently expanding into central and western Europe. In Romania, their number is estimated to have increased from little less than 5,500 in 2012 to almost 11,000 in 2017. In the end, although some see it as a controversial animal, mainly because of the damage it causes by killing domestic animals, the golden jackal’s expansion (even at this rapid pace) came as a natural thing, this wild animal being part of the ever-evolving nature.